Allan Forman was born by the beach on Long Island, in a cottage built by his Mayflower ancestors. He grew up in a Victorian brownstone in Brooklyn Heights. His father had made a fortune from warehousing snuff and tobacco during the Civil War. Educated at the prestigious Brooklyn Polytechnic Institute, Allan started writing for the Brooklyn Daily Eagle in his teens. 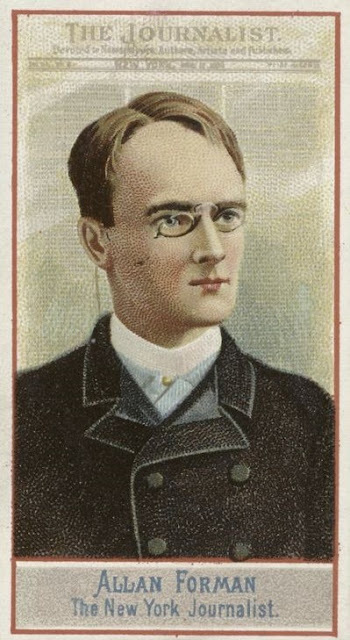 The paper’s editor, Thomas H. Kinsella, sent him to San Francisco to cover riots incited by an Irish labor leader named Denis Kearney. The violent fury directed at Chinese immigrants ended in death and destruction, and disgusted the young reporter. Allan went on to Williams College in Massachusetts and always made a fuss about it, although he did not graduate. Back in Brooklyn, Allan’s stories appeared regularly in newspapers and journals. Now he had two important mentors: Samuel S. Conant, editor of Harper’s Weekly, along with Kinsella of the Eagle. In February 1885, Conant disappeared into a nineteenth-century melodrama involving a barroom, a watch & chain, and a man resembling him who might have taken a train to Florida. Part of a search party, Allan scrambled around the beach at Coney Island, looking desperately for Conant and interviewing the proprietor of the Ocean House hotel where the editor might have been seen last. S. S. Conant never turned up. Not long ago I chanced to meet a lawyer somewhat prominent in a certain class of criminal case. After a few moments’ chat, I invited him to the theatre. The lawyer’s invitation chimed in with my lazy mood, and, hailing a passing hansom, we were whirled to our destination . . . 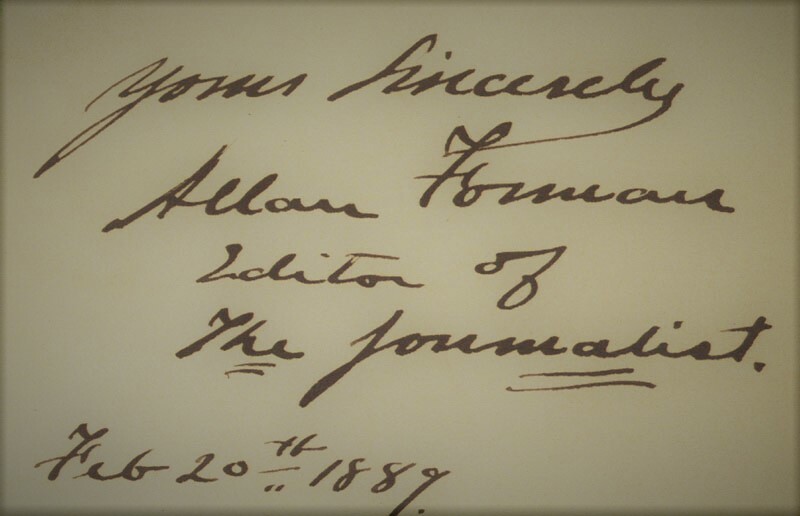 Already well-known in the world of the New York press, Allan really arrived when he took the helm of the first magazine devoted to journalism, The Journalist. The weekly was a few years old when he became editor in 1886. At the time, press clubs had been established in most major U.S. cities. But reporters, publishers, and illustrators missed having a publication dedicated to their profession. 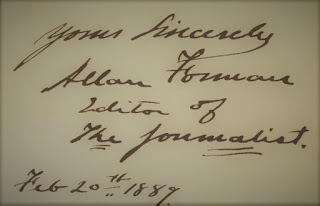 The Journalist didn’t always fit the bill because Forman published whatever struck his fancy, but he would lead it for 22 years. Unfortunately, too, he was for sale – as scandals revealed in 1891 and 1905. It turned out that Allan had deals with the New York Life Insurance Company and the Mutual Life Insurance Company. He offered himself as a “press specialist.” For a fee, he used his influence to place flattering stories about the companies in newspapers around the country. He might praise old management over new management, discredit newspaper investigations into corporate corruption or “spin” bad news. In fact, Allan may have been the true father of public relations. Despite the bad publicity about Allan’s subterfuge, he carried on. However, the prestigious Lotos Club kicked him out for violating house rules and endangering others, so perhaps he was upset about something. Once again, Forman remained untarnished. But he must have been running low on cash. In 1896, he brought a suit to have his father declared insane after his mother refused to give money to one of Allan’s creditors. Justice Osborne of the Brooklyn Supreme Court accepted the testimony of two doctors: the elder Forman was competent to manage his own affairs. Then Allan’s first wife, Florence, divorced him, so he went off to Egypt for two years and left The Journalist in the hands of Marguerita Hamm, a pioneering woman reporter married to the jolly lawyer who lured him to dinner in Chinatown. Allan had always loved the theater and occasionally wrote for The Dramatic Times. He liked to hang around backstage and gather gossip. In 1900 he remarried to a Swedish actress with the incomparable name of Xesia Yrsa Zephania Carlstedt. *Ultimately, revelations about political slush funds and investing for self-gain led to significant regulation of the insurance industry. I so regret not having a child just so I could name her "Xesia Yrsa Zephavia Carlstedt."